In preparation the 2016 American Planning Association (APA) National Planning Conference in Phoenix, AZ, we look back at a young planner's recollection of attending the conference for the first time in 2015. I’ve had a lot of incredible opportunities in my short run as a beginning planner. While studying for my Master’s in Urban & Regional Planning at the University of South Florida, the Sun Coast Section of APA paid my way to the Florida APA conference in West Palm Beach. The next year, I was fortunate enough to attend the Florida APA conference in Naples, again with the help of the Sun Coast Section. My classmates and I went with the intention of making professional connections with established planners who would help get us jobs right out of school—errr, I mean, who would mentor us. As a starry-eyed student learning about theory and history in classes, a lot of the material in the sessions skimmed over my head like grease on a doorknob. It turns out I did get a job right out of college, with the City of St. Pete Beach. The budget for travel and training has allowed me to go to the annual Florida APA and Florida Planning & Zoning conferences every year, but going to the national APA conference never seemed feasible. This year I wrote an essay solicited by the Young Planners Group section of APA and won a scholarship towards attending the national conference in Seattle. It was the best professional decision I have made to date. In school I read articles about how progressive Seattle is in terms of alternative energy production, public transportation, urban farming, and other trendy sustainable topics most urban planners drool over. What I didn’t anticipate was how clean and nice it is. I never saw one piece of litter, no overflowing trash cans, and no chipped paint. You can tell who the tourists are because the residents obey the crosswalk signals–even when there is no car in sight. On the first day I took the Legacy Landmarks Mobile Tour–a tour of Seattle’s neighborhoods by motorcoach. 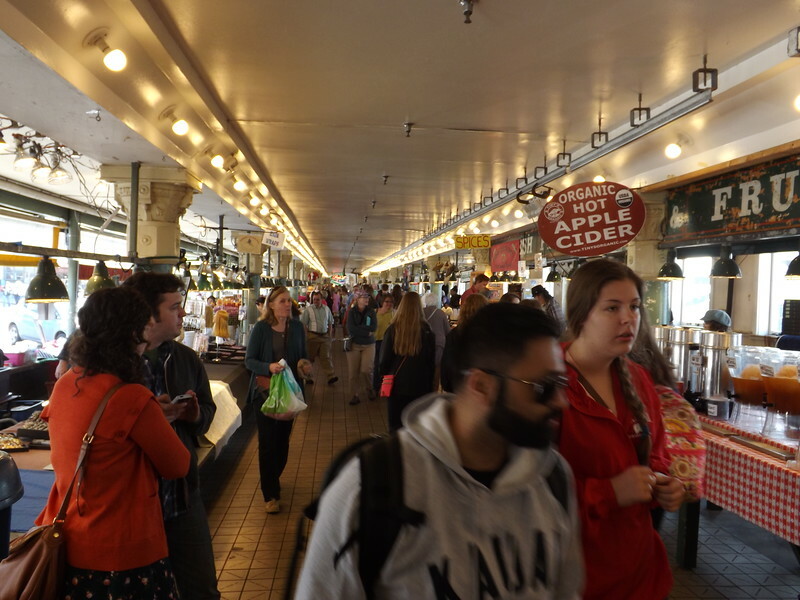 We started out in the commercial core, drove by Pike Place Market (which I couldn’t wait to explore), then through Pioneer Square, which seemed like a continuation of the commercial core. Through the International District I could see a change, picking out some different architectural elements and language on signage–mostly Asian. Also felt an urge to get out and explore here. Next, we headed to Beacon Hill, located on a ridge with views of the Cascade mountains to the east and the Olympic mountains to the west and to Columbia City, a neighborhood where over 60 languages are spoken (Rainier Chamber of Commerce, 2009). These had a slightly different feel to them. They were more suburban, with single-family and multi-family dominating, but each with a small neighborhood center. Next, we crossed Lake Washington to Bellevue, a very high-end neighborhood; and Fremont and Redmond, which had a younger and more off-beat feel. 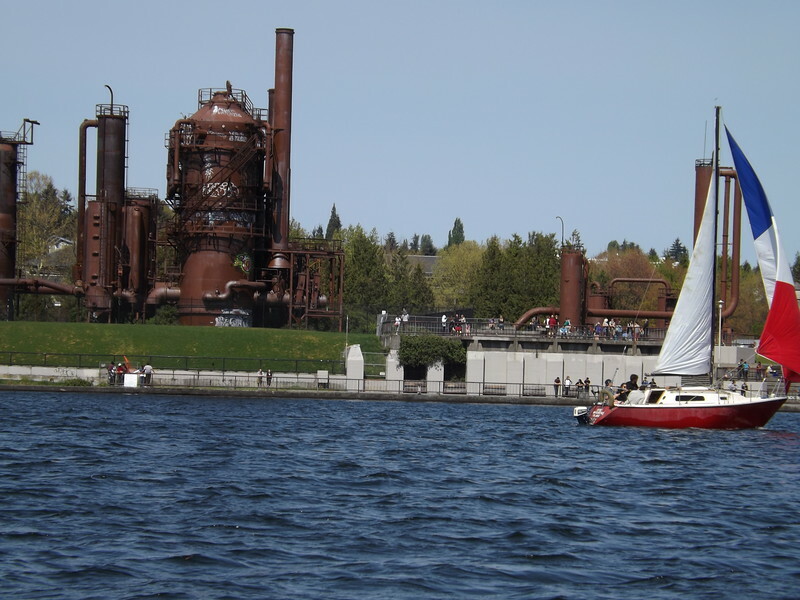 On the return leg, we passed through the University District, took a break at historic Gas Works Park, then headed through Ballard (I chose this neighborhood to explore later because I was drawn to its history of being an old Scandanavian shipping town). There were a few other neighborhoods we went through, but you get the gist. Each of these neighborhoods had their own identities, although they were all within the metropolitan boundary of Seattle. For one thing, some of them, like Ballard, used to be their own town. But somehow they have each preserved their unique character. I wondered if it was due to implementation of design standards within Seattle’s zoning code. While Fremont and Redmond seemed to encourage quirky and artistic buildings along with public art, Ballard had an architectural pattern of panel siding and galvalume metal roofs, reminiscent of an industrial sea port. A common theme that all the neighborhoods had, however, was their recognizable neighborhood cores–the place where people gather to shop, dine, drink, or recreate. It was important to see this as a young planner, especially because I can now take this back to St. Pete Beach and apply that same principle to our historic district. But I can also take it wherever I go in my profession, keeping in mind the importance of a strong center where people can congregate either in retail stores, coffee shops, bars and restaurants, or parks. 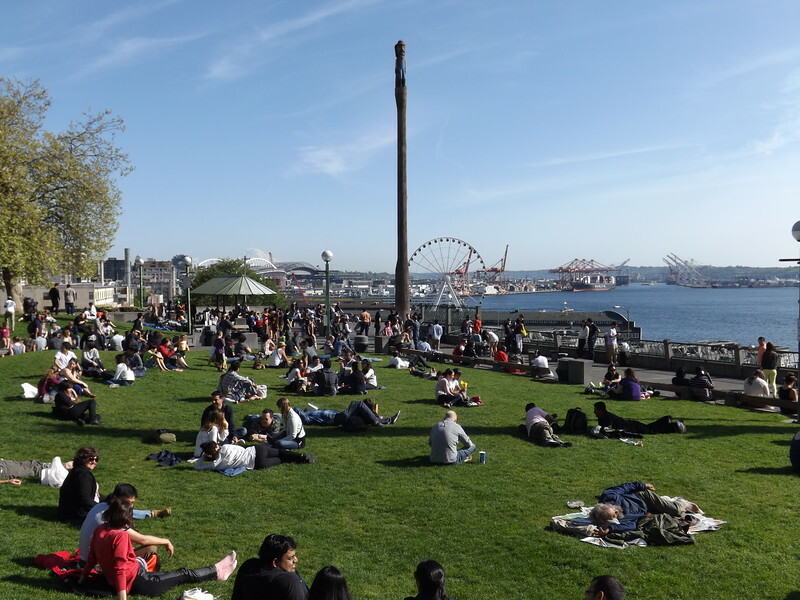 The park system in Seattle stood out as a top priority in each part of the city. I realized how important the parks are and how lacking my place of residence is, as I was walking through a small park on my way to the Washington State Convention Center to attend my first sessions of the conference. It wasn’t just green space. It had tables to sit at, a grassy knoll to lie on, beautiful landscaping, and interesting architecture. All of these things, I’m sure, are reasons why every time I walked through it on my way to and from the Convention Center, I saw people utilizing it. Then it dawned on me that this wasn’t only a park–it was my shortcut to the Convention Center rather than following the sidewalk grid. How creative to embellish a pedestrian pathway that was most likely unanticipated (it was on top of a highway)! I started thinking about “hidden” pedestrian pathways in my city that could be improved, many of them alleyways. You could read about these things in books, but experiencing them and coming to those realizations on your own accord by just observing your surroundings is a completely different (and meaningful) experience. Conferences are, of course, beneficial for their sessions as well. Although I’m not yet AICP certified and thus didn’t need the CM’s, I got a lot out of the sessions. One made me text my boss back in Florida, “Watch out…I’m coming back with some crazy ideas! !” and was about solar energy. It was a panel made up of representatives from SunShot Solar, the Department of Energy, and the City of Seattle to encourage community solar programs for residents to connect to instead of, or in addition to, traditional sources, such as electric. They are either owned and operated by the local utility company or a city or region could be completely independent like the City of Seattle is. When the director of the city’s solar project said that Seattle doesn’t even need solar energy because they get most of their energy from hydro (88.9%), nuclear (4.5%), and coal (1.7%), I felt very ashamed that I lived in Florida and didn’t know of one city who had a solar program (Seattle City Light, 2015). Then immediately I got the urge to start a solar project with a conglomerate of beach communities. Especially as a beginning planner and not having as much experience or travelling under my belt as some of my more seasoned colleagues, being able to take example from a city such as Seattle was invaluable. It was a once in a lifetime chance for me to be out there learning about planning both hands-on and in class. There is so much more I could talk about–the alternative forms of transportation, the historic preservation, the sense of community pride–but it won’t all fit in this already-too-long article. I will just say that I am so grateful to the Young Planners Group for choosing me.